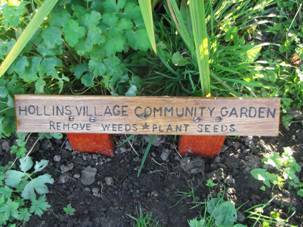 Hollins Conservation Group would like the support of the whole community. Over the past twelve months we have been working hard to improve Hollins Village. Clearing litter, removing weeds, planting flowers and shrubs in public spaces. Our new sponsored green litter bins have been springing up everywhere. However, our brushes are losing their bristles, wheel barrows have squeaky wheels and tools are becoming blunt! Backs are aching but that’s another story…we aim to continue with the work. ASDA has offered us the opportunity of a £500 donation towards new equipment. When you shop at ASDA Pilsworth, please ask for the green charity tokens and place them in charity collection box number 1 – the yellow zig-zag – in the foyer. Thank you for your support and the kind words of encouragement when you see us working every Thursday morning. You can always come and join us!